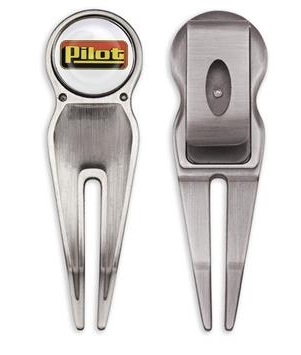 Golf divot repair tool with reverse side belt clip. Easily attaches to belts or pockets for easy access on the greens. Divot fixer features a luxurious antique nickel finish. Magnetic base holds a custom removable ball marker with full color poly dome imprint. Ball marker size: 7/8" diameter. Fast 6 working day production. Rush Service Available.